Happy Sunday! ;-D Summer vacation days are coming! If you haven't got yet the latest issue of Smart Parenting, please take a look on what Smart Parenting March 2012 issue has in store for us. I'm sharing a PR in behalf of Smart Parenting. 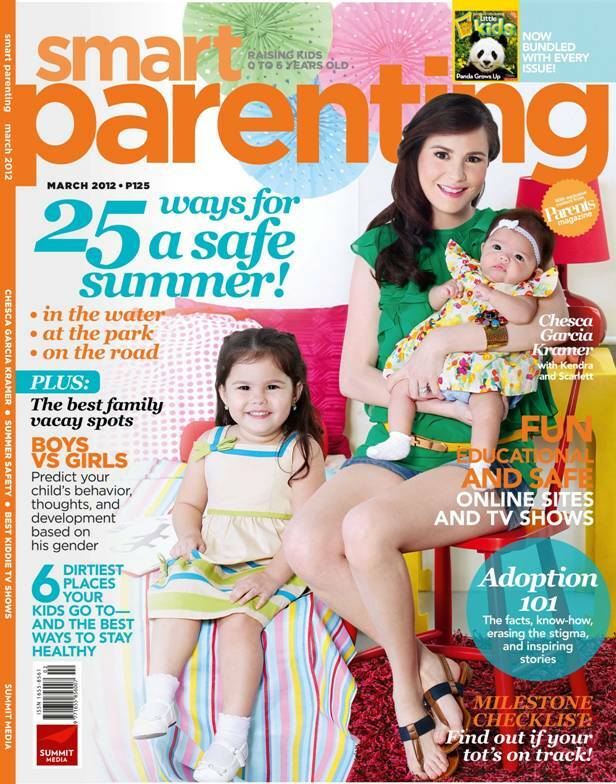 Smart Parenting March 2012 Issue with Chesca Garcia-Kramer with her daughters, Kendra and Baby Scarlett, on the cover. Summer is the time of the year where kids enjoy playing outside more often, making them prone to accidents like slipping by the pool, scraping their knee, and more. Keep your worries at bay as the March issue of Smart Parenting is filled with tips, features, and stories to help you have a happy and worry-free summer. Playtime with other kids can also be a venue for children to hurt each other unintentionally. This month’s issue provides expert advice on how to make your child understand the importance of saying sorry and how you can teach them to apologize. The March issue of Smart Parenting, which comes bundled with the latest issue of National Geographic Little Kids, is available in newsstands, bookstores, and supermarkets nationwide for only P125.